Dynamicx Drums entered the music world in 2010. 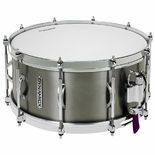 A division of Black Swamp Percussion, Dynamicx applies the experience and passion of Black Swamp to a unique drum set snare drum series. Each drum delivers personal characteristics through a wide tuning range and colorful tonal spectrum. The spectrum of shell sizes and materials guarantees there's a drum to meet the diverse needs of musicians.